The John Hancock Center is perhaps Chicago’s most iconic skyscraper, a black trapezoid rising 100 stories beside the city’s shimmering lake. It is here, on the 24th floor, that Richard Gray Gallery (itself based in the building) found a vacant 30,000-square-foot office complex, likely forsaken by the current economic troubles, as the evocative location for Jan Tichy’s sprawling installation. The lift door dings open to reveal an empty office suite. The lights are off. The ground is concrete, but filing cabinets remain. A low mechanical hum from the lift shaft produces a form of eerie, constant silence. Within this darkness, the nine video installations by Tichy emit their own light: phantasms amid the shells of former conference rooms and corner offices. In Installation No. 4 (Towers) (2008), a gash of animated light creeps open on the floor. The slit extends itself slowly, a wavering mirage. Finally, it opens fully to cast a moonlight glow over two nondescript, white paper sculptures of towers. In the American Midwest, these structures would be placid water towers standing proud in small towns; in the Middle East they are oil rigs or military surveillance posts. Later, the animation depicts a lone wolf strutting past the towers: a dark omen. Tichy’s politics are emotional rather than ideological, moody but not impassioned. Born and raised in Prague, he left in the aftermath of the 1989 Velvet Revolution and emigrated to Jerusalem. There he lived through the recent Israel–Palestine conflict, and in 2007 emigrated again. Presently, he lives and teaches in Chicago. As Tichy often considers the conflicts and complexities of the urban experience, the Hancock Center’s corporate ruins are a fitting setting for his work. 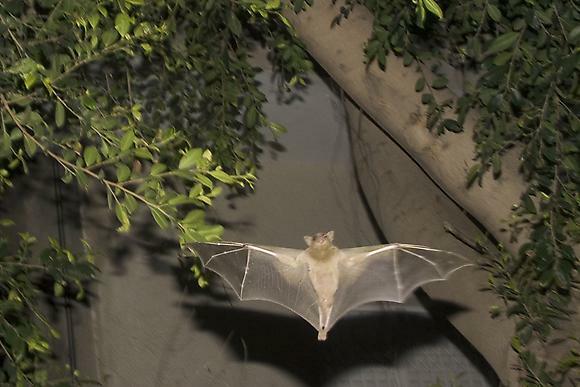 In Bats (2002–7), 35mm slides depict bats captured mid-flight at night. The high-pitch sound emitted from Tichy’s flash equipment as it powered up attracted the bats, so he mimicked the noise with his mouth, luring them into his lens’ purview. Seen from below, the flighty creatures reveal their odd little bodies in a glowing beam of light, their shadows cast long against Tel Aviv’s architecture while the city’s residents sleep. Similarly, Tichy lures viewers into his political commentaries, suspended in theatres of light and shadow, where ethereal objects, such as bats, garner meaty symbolic contours. But Tichy pulls a quick change, diverting the sensory bath with an optical shift. He frames each scene from a distant vantage point, from outside the action. In one video we observe a children’s playground from a nearby rooftop; another uses aerial maps; yet another shrinks the Chicago skyline through a camera obscura’s pinhole. The tower installation, too, forces a bird’s-eye-view. The simultaneous immersion and disengagement serves to dramatize how viewers participate in the political landscape. We crave a spellbinding, affective experience but often meet a cold narrative ellipse. ‘Pictures’ (2006) is a series of seven videos from a Tel Aviv slum where the artist worked. Each static camera position documents a tableau of the city’s margins at night: a fire endangers a horse, a neighbour paces behind open curtains, searchlights crisscross the hazy sky. Like postcards, they are formally tight, even beautiful. From a distance, the decaying slum is momentarily wrapped in aesthetic delight. We’re thrust eye-first and heart-long into contradiction.